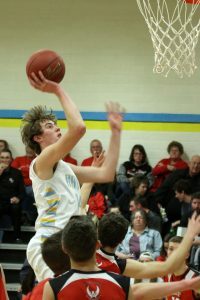 The Lynnville-Sully boys picked up a couple of conference victories last week but ended the week with a loss to Class 2A Albia on Saturday. The boys went on the road for another win against the Braves on Tuesday, Jan. 16. Showing their dominance for the second time this year, the Hawks triumphed over conference opponent Montezuma, 55-45. Junior Rylan James goes up strong for two points against Montezuma. James led in scoring and rebounds. The Hawks led throughout the game, up 10-7 after the first and 28-23 at the half, but the Braves were always close and even outscored L-S in the third quarter. In the fourth quarter, the Hawks broke away and finished the game up, 55-45. "We struggled to get things rolling offensively, but the guys found other ways to get it done. We fought hard defensively and on the boards," said head coach Nick Harthoorn. "When they fouled us, the guys stepped up to the line and knocked them down." Junior Rylan James led the Hawks in both scoring and rebounding, putting up 13 points and pulling down 10 rebounds. Senior Jesse Van Wyk tallied 12 points and had eight rebounds. Classmate Brevin Hansen chipped in 10, and junior Tyson Vander Linden contributed eight. Together, the boys totalled 41 rebounds, five blocks, and four steals. They were 16-of-49 from the range and an impressive 21-of-22 from the free-throw line. In their second SICL game of the week, the Hawks hosted North Mahaska on Friday, Jan. 19. The boys easily defeated the Warhawks with a final score of 68-31. The Hawks took the lead in the first quarter with a score of 25-7. They continued to reign in the second quarter, making the score 37-15 at the half. The Hawks put up an additional 31 points in the second half. North Mahaska couldn’t keep up, scoring only 16 points in the second half. The leading scorer of the night was James with 15 points. Senior Hansen scored 11 points, and senior Tanner Foster scored 10 points. Van Wyk put up nine points for the team, and Vander Linden had seven points. Altogether, the team had 36 rebounds and 15 assists. 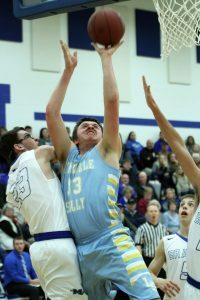 A short day later, the boys suffered a loss while hosting Albia on Saturday, Jan. 20. The Hawks were at a disadvantage early on in the game, behind 18-13 after the first quarter. They made up ground in the second and third but were unable to catch up, taking the loss, 65-57. "Albia played a nice game tonight. They had some guys step up for them," commented Harthoorn. "We didn't bring the defensive intensity early on, and that allowed them to get it rolling." Hansen led in points, scoring a solid 18, nine of those points coming from three-pointers. Van Wyk put up 13 and also had eight rebounds. Vander Linden contributed eight points, and James added six. Free throws were important as the teams totalled 40 fouls; L-S had 21 of those fouls, 15 of them coming in the second half. The Hawks were 13-of-18 from the free-throw line. The team shot 19-of-51 from the range and totalled 30 rebounds. L-S was able to limit their turnovers to eight and had four steals. The 12-3 L-S boys were scheduled for a road game at Colfax-Mingo on Tuesday, Jan. 23, and another away game this Friday, Jan. 26, at HLV.